United States & United Kingdom are where most visitors come from. Topics: Wiki, and Green Campus. Age: It went live on November 8th 1996, making it over 21 years, 5 months old. 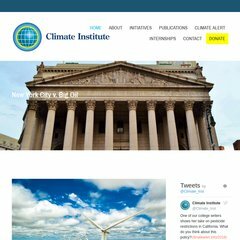 climate.org Articles about Climate Change, Extreme Weather, Ecosystem and .. The site has about 585 users daily, viewing on average 1.40 pages each. honda.com Honda.com: Official Site of American Honda Motor Co., Inc.
Climate.org's IP address is 74.53.76.205. It is hosted by Theplanet.com Internet Services Inc (Texas, Houston,) using Apache web server. There are 2 Nameservers, ns1.irisweb.net, and ns2.irisweb.net. PING (74.53.76.205) 56(84) bytes of data. Pinging the server, resulted in a 33.2 ms response.